William Arthur Blog: Why Send Holiday Cards? Valerie reports that her corporate clients want to send holiday cards of high quality to reflect well on their companies and to show regard for their customers. Last year when Valerie sent the Vera Wang Longfellow card (shown below, right), many of her customers and friends commented on what a special item it was to receive in the mail. Christmas cards originated in England during the Victorian era. Artist Louis Prang, a German immigrant who settled in Boston, Massachusetts, elevated holiday cards to an art form. His Christmas cards were introduced to America in 1875. They became so popular that by the turn of the century, hundreds of printing companies were creating holiday cards to suit the tastes of Victorian consumers. The cards of this era were astonishing: charming shapes adorned with silk fringe, ribbons, lace, crystals and elaborate, layered embellishments. The vintage cards shown below were photographed this past fall on a visit to Hallmark Cards, Inc. in Kansas City, Missouri. 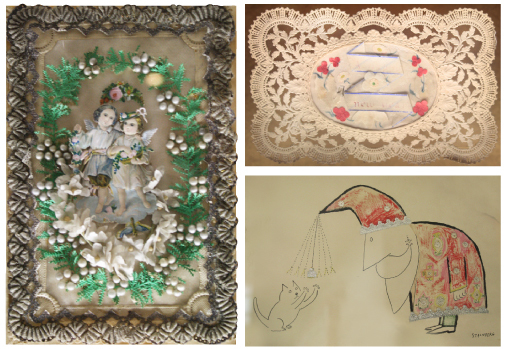 The lace card on the top right is a 19th-century new year’s card, the wording now faded with time. The bottom right image is also from the Hallmark collection, an original work by artist Saul Steinberg. He was commissioned by Hallmark to create what became a highly successful line of whimsical holiday greeting cards in the 1950’s. We love the quirky details on Santa’s coat, and who wouldn’t love that cat? We all love receiving holiday cards every year, appreciating that others took the time to remember us. And we send them for the same reason, knowing how good our recipients will feel when they get our cards. Touchstones of connection and tradition, holiday cards are reminders of the simple joys of giving and receiving. To see the full offering of William Arthur, Vera Wang, and Prentiss Douthit holiday cards, click here, merrily!